EXPANDED NEW EDITION! A Complete Course in Playing Winning Limit Hold’em No Limit Hold’em has become the glamor game of poker. Yet today’s savvy pros know that some of the best low-risk money-making opportunities exist in Limit Hold’em. 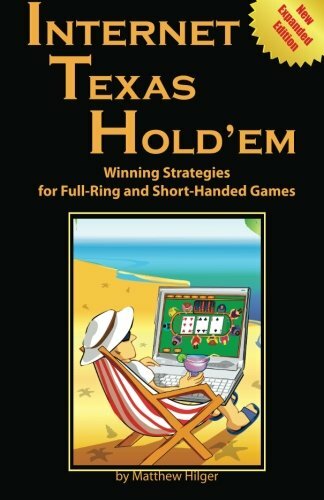 This complete manual will show you how to consistently beat today’s Limit Hold’em game, whether you play on the Internet or in live games. Revised, updated and expanded with over 100 pages of all-new material and over 250 sample hands to bring the lessons to life, this classic text shows you how to win again and again. Step-by-step and hand-by-hand, you will learn: – Which starting hands to play Pre-Flop – How to turn sound poker theory into winning play – Traps to set and minefields to avoid – How to play through the Flop, the Turn, and the River – The odds and probabilities every successful player must know – How and when to bluff and how to pick off habitual bluffers – …and much more Plus detailed new chapters that include a complete strategy for conquering short-handed games and the keys to playing in multi-way pots. Poker is a fun game, but it is even more fun when you win. With poker professional Matthew Hilger’s Internet Texas Hold ’em as your guide, you can master in hours what most players take a lifetime to discover.